This offer is good through April 1, 2012. According to the EPA, National Academy of Sciences and the World Health Organization, Radon accounts for over 20,000 lung-cancer related deaths in the United States each year. In fact, radon accounts for more lung-cancer related deaths than secondhand smoke. Radon’s most dangerous attribute is its subtlety. Colorless, odorless, and chemically inert, elevated radon levels will go undetected in nearly 1 of every 15 homes in the U.S. While most folks are aware of the damaging effects of radiation, few realize that as much as 55% of a person’s total radiation exposure comes from radon gas and its damaging decay products. 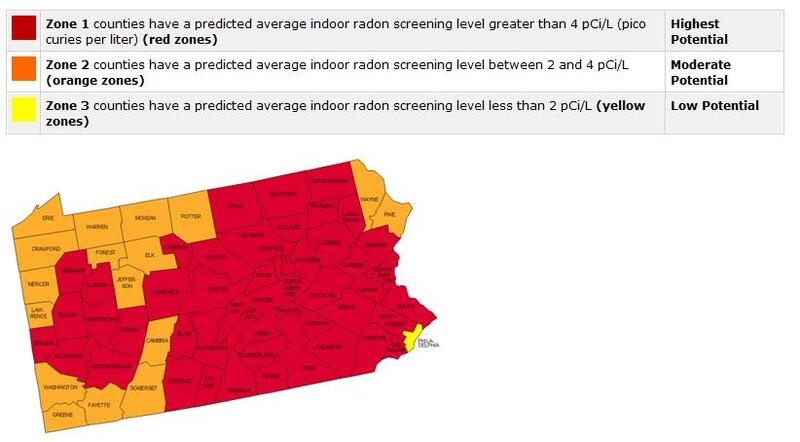 Central PA is home to some of the highest radon levels in the nation (see PA Radon Level Map). While correcting a radon issue is a relatively easy fix, few homeowners realize they have an issue until they are in the throes of a home transaction. Fewer still consider testing their private drinking supply. In addition to radon entering a home through the foundation, radon mixes easily with water and may also enter through private wells. Curious about possible Radon levels in your area? Click Here to Enter Your Zip Code. appointment for your home or private well water supply testing. Unlike most companies in the home inspection industry who use continuous radon monitors or activated charcoal, New Leaf uses one of the most accurate measurement tools available, electret ion chambers, to ensure some of the most accurate measurements possible. Our methods are every bit as fast & more accurate than the other guys. It’s your home & your health. Why expect anything less?